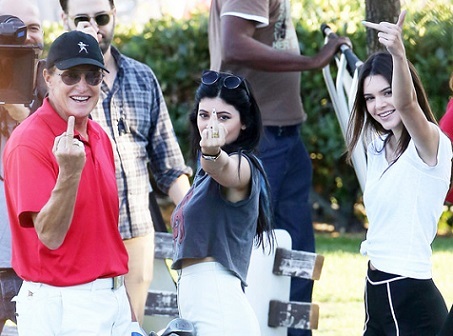 Bruce Jenner, Daughters Kendall and Kylie flip off Paparazzi while spending the day at the golf course. The trio joined in together to flip the paps the birdie to show how they really feel with smiles on their faces. Kendall retweeted Khloé Kardashian Odom's post from this morning on Twitter, "My motto lately.... F--k you." Looks like Daddy Jenner needed some time with his girls in wake of his marriage break-up with Kris Jenner hitting the news earlier that day.